This time I used only natural fibers (silk and cotton) and glass and wood beads. Gives a little different effect than the last one. The third mossy patch is in progress now. Can't wait for my little rock garden to be finished! Can't wait to see it in all it's glory. How many have you made now? I really like this one! 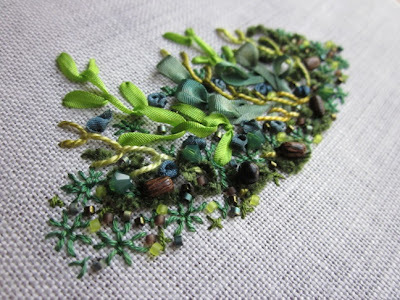 The ribbon leaves and stems look like tender green shoots just popping up - and the wooden beads look like bits of branch caught in the moss. Love that! You are do creative! !